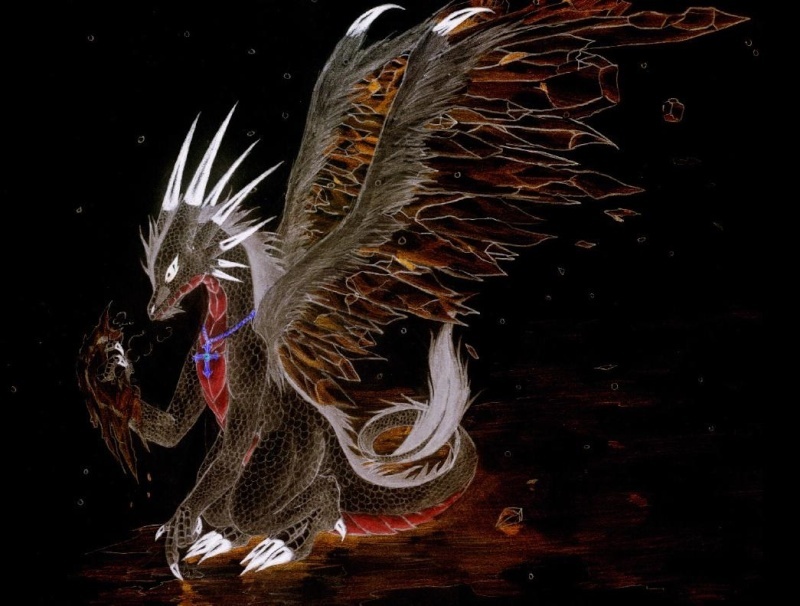 Zyailor decided to go exploring close to EarthWing lands, where he came across a large rocky desert. Curious he soared over the harsh roasting rocks below him, spotting what seemed to me a small tunnel in the ground, like a sinkhole randomly in the desert. It was small around 8ft in diameter enough for him to go and investigate, he chose to go in the dark tunnel which lead to a 'hub' area with multiple gateways at the bottom. 'There must of been a group of dragons or some creatures living here before' he thought to himself, he spoke aloud "Hello??..." to see if he was intruding someones home. After not recieving a response he decided to go down one of the tunnels, there was 5 in total all going in different directions. After a brief ponder he heard a noise coming from one of the tunnels. Again he spoke "Hello?... who's there?" Zya bit his upper lip, wondering what they could do, when Chibi suggested Ninja he look at with a confused look, "What's ninja?" he asked while walking up towards her giving her a nuzzle with his snout. Then giving out a cheeky smile, sticky his tongue out. Chibi, responded to Zyalor's actions with a run of her snout, and a gental nudge. "Ninja, is a game when you start off by picking an epic pose, then one player poves. You try to strike the others paws with yours! you can only take one step a turn, which makes it hard, but you can dodge, butwhere your hand stops it stays until your turn. Any questions?" The white dragon told the skywing. She waited paitently for his answer. Zya nodded, "Sure, I can't think of anything else anyways" he laughed, and gestured towards Chib. "You can start" Zya was still a bit unsure what the game was like but he enjoyed Chib's company anyway. Chibi got into "the crane" ninja postion. She waited for ark to make his turn before she started to whack, on her turn to start the game. Zya looked at Chib still a bit confused but went ahead, he couched down preparing to defend against an attack. He laughed and spoke "Your turn" he smiled awaiting to see what the game is like. Chibi lunged one foot forwards taking only one step, and slapped at his waste where his hands where then dramatically swung them back before she stopped, and her turn ended. Zya was shocked by the sudden strike, growling slightly then pounced suddenly towards Chib and slapped her paws then returned back into his defensive position. He was starting to see the fun, but the rules seemed a bit weird how does someone win he thought. Chibi giggled, then hopped forwards landing on Zyalor's paws, and tilted her head back so that they would push Zyalor over. "Did you forget about my other paws?" she questioned. Chibi then turdiously kicked Zyalor's back paws. "I win!" She bluntly chants as she is getting squashed by the larger black dragon. She then tries to wiggle free. Zya smiled "Yeah you win... I'm not as good as you" rolling onto his back looking towards Chibi with a sad expression giving her the 'puppy dog' eyes again. It was starting to get dark as the sun disappeared from the horizon, only the orange light shining onto the clouds remaining for light. Chibi giggled. "That's ok. You are new at the game, and your pretty good at it." She turned her head to notice the sun setting. "Oh, hey look. It's getting dark again. Want to watch the sun set? I don't have anything to do tomorrow, so we can be out pretty late tonight." She told him while looking at his puppy dog eyes. She went over to give him a hug. Chibi nodded. "Yeah. Let's go. I'll race ya there!" she told the Skywing while running to the tree. She looked to the side to see the orange sky, and everything beautifully stained orange, including herself. Zya gasped with a smile, chasing after Chib he managed to catch up and tackled her tail. Making a playful snarl he hugged her, as they rolled under the tree. "Got ya!" he shouted continuing to hug her, then following up with tickling with his paws. Chibi laughed and pushed him off, then charged up to him to give a tackle hug. She held him tight, and whispered in his ear. "I love you Zyalor, and remember that." She held him even tighter, as if something was wrong, but nothing was. Her mind was clouded with thought, but now was the time to forget about all of them. Now was the time that she could be happy. Zya was glowing with happiness, he blushed when Chib whispered in his ear responding with returning the hug and twining his tail around hers, "I love you too" he whispered and smirked, rolling onto his back pulling Chibi with him he laughed and continued "I'm not letting go!" Chibi blushed and hugged him back as she nuzzled the skywing with great love. She responded. "I'm not letting go either, but that doesn't mean that we can always be together.... we can do one thing though, but I want to relax tonight." She lovingly rubbed her face against his and "purred". Chibi nodded and spoke to the skywing shortly after nuzzling him. "Yeah, we can. We wouldn't see each other much since how far away the tribes are, and our work hours. That won't destroy our love though. Right?" She wanted to be with this dragon more then ever, but she knew that it would be hard. Zya frowned slightly letting out a sigh, "But I want to be with you... I could always join the Firewings... but I don't know..." His buzzing feeling stopped suddenly as he felt sadness at the possibility of not seeing Chibi much. "W..What you think?" giving her the 'puppy eyes' again continuing to hug her. Chibi frowned and leaned over to the skywing. She sighed deeply surrounded by her though. She nuzzled Zyalor then looked over at him with her clouded eyes. "Do whatever you want, just don't let it ruin us." She then ploped down and let herself slide onto the ground so thet she was laying on her back. Frowning with a confused look he responded "Why don't you want me to join?.... how else would we spend time together..." locking his gaze towards the ground, unsure what to do, he hoped that there was a solution which could provide them both with happiness. Turning to face Chibi he gazed into her eyes, searching for an answer, creeping close he laid next to her. Chibi got up and frowned. "I never said that and you know it. Don't you even dare shove words in my mouth! Besides, I told you to do whatever you wanted! Obviously youi didn't lisen!" She scolded the male dragon. She kicked up dust and stomped her way towards the tunnels and got ready to go back to the firewing territory. frowned getting back onto his feet, darting towards her "Look... I'm sorry but its just the way you said it would ruin us... I can join Firewings... but I don't know if they will accept me" trying to reason with Chib he managed to get in front blocking Chibi's way, giving her the 'puppy dog' eyes again. "Please... don't be mad at me.." he responded with a sad voice, frowning gazing towards her.